Have you ever read a book that makes you want to pull the characters into your arms, rock them gently and tell them everything is going to be OK? This is exactly what I wanted to do the whole way through Katherine Applegate’s beautiful story, The One and Only Ivan. 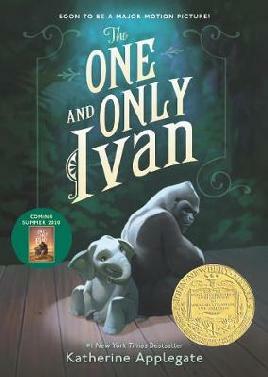 Instead, Ivan thinks about TV shows he’s seen and about his friends Stella, an elderly elephant, and Bob, a stray dog. But mostly Ivan thinks about art and how to capture the taste of mango or the sound of leaves with color and a well-placed line. I can’t recommend The One and Only Ivan highly enough. It’s a story that will affect you and the characters will stay with you long after you close the covers. Looks like a lot of fun, I loved the trailer for this book.